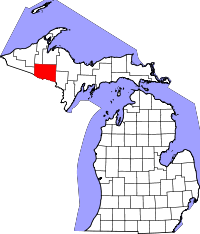 Located in the Courthouse of Crystal Falls, MI., at 2 South Sixth Street, the Iron County Clerk has birth, death, divorce, and marriage records, all available from the early 1890s to the present. All records are open for public research except for birth records, which are limited to either the person listed on the certificate, or relatives or legal guardians. Certified copies of records cost $10 for the initial one, and $4 for additional copies. Space is limited in the genealogy research area, and as such, only two researchers are allowed at one time. The County Clerk's office also has applications for certified copies of records available on its website, along with the required steps and fees. To contact the vital records department directly to inquire about obtaining records by mail, or to schedule a research session at the office, call (906) 875-0609. The office is open from 8:00AM till 12 noon, and 12:30PM till 4:00PM every weekday.